Bom ba ba bom ba bom ba bom bom ba ba bom ba ba bom ba ba dang a dang dang Ba ba ding a dong ding. That is how “Blue Moon” started, but you will have to forgive me if there are some spelling mistakes. Also, I don’t care to mention the rest of the lyrics. 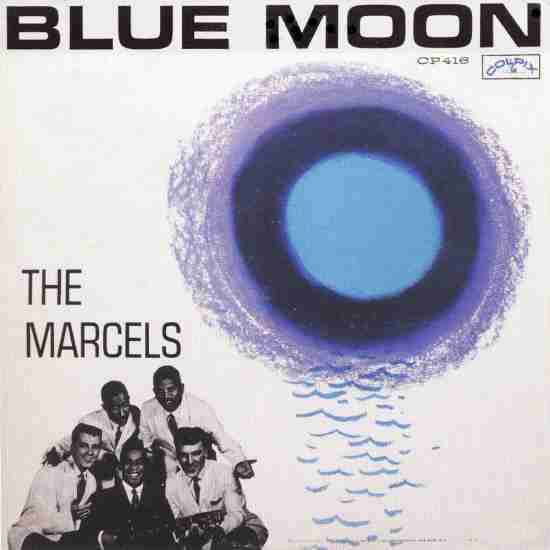 The Marcels put such a definitive stamp on “Blue Moon” that it is almost inconceivable that this was a cover of a 1933 song by the Broadway team of Richard Rodgers and Lorenz Hart and was actually a hit for other artists. Billy Eckstein went #21 with it in 1949 and Judge Harry Stone’s favorite crooner, Mel Torme went to #20 with it that same year. Elvis Presley even recorded a version on his debut album, but it was the Marcels, an interracial doo wop group from Pittsburgh that are synonymous with this particular song. What made the song of course was the introduction with the long series of non-words, which was actually a throw away from another song they used to perform. For many (myself included) this lengthy gibberish makes the song so memorable, but there have been critics who have called it “novelty doo wop” and have dismissed as fluff, but they can’t call it unsuccessful. Actually, that last accolade is a bigger deal to me. Other Notable Songs that charted but did not go to number one in this time period: April 3, 1961 – April 23, 1961. 4/3/61: Bewildered James Brown went to #40 and would reach #8 on the R&B Chart. Did anyone other than John Larroquette ever work again after Night Court went off the air? I had such high hopes for “An American Werewolf in Paris”. What a let down that movie was. I guess it should have stayed in London.